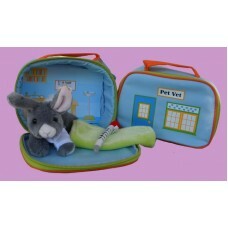 Pet Vet /Bunny:"My Pet's Playsets"
7" W. x 6" H.--Zippered nylon-canvas "Pet Vet" Playset includes 5" gray Bunny with removable "Sling", a 5.5" sq. velour blanket, a plush thermometer & a scenic background of a vet's office inside! Add $6.00 for NAME.